The TISS is a multi-campus public funded research university in Mumbai, India. TISS is Asia’s oldest institute for professional social work education and was founded in 1936 in then Bombay Presidency of British India as the Sir Dorabji Tata Graduate School of Social Work by the Sir Dorabji Tata Trust. In 1944, the institute was officially renamed as the Tata Institute of Social Sciences and in 1964, the Government of India declared TISS as Deemed university under Section 3 of the University Grants Commission Act (UGC), 1956. The CLL is an Independent Centre at the Tata Institute of Social Sciences, Mumbai. Centre for Lifelong Learning was established in 1981 as the Department of Extra Mural Studies and was renamed in 2006. The CLL offers a vibrant learning environment for learners of all ages ranging from 18 to 81 years. It is supported by its own faculty, as also from other Schools and Centres of the Institute and visiting faculty from across the best institutions in the country. Some of the significant adult learning programmes include Certificate, Diploma and Post Graduate Diploma in Counselling Skills, Diploma in Gerontology, ODL Diploma in Youth Leadership and and Social Change & Diploma in Dance Movement Therapy and Certificate Programmes in Geriatric Care and in Oncological Care Giving. The diploma program is associated with the Centre for Lifelong Learning. 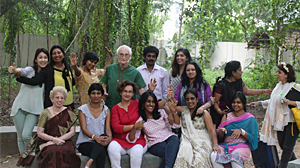 The IIP is the first formal institute teaching Psychodrama in the country. This institute is an affiliate member of the International Association of Group Psychotherapy and Group Process (IAGP). The founder and director, Magdalene Jeyarathnam is an elected member of the governing board of IAGP. IIP will enable those interested in Psychodrama to receive training, certification to practice skills under supervision and to gain experience applying these methods in clinical or non clinical settings. 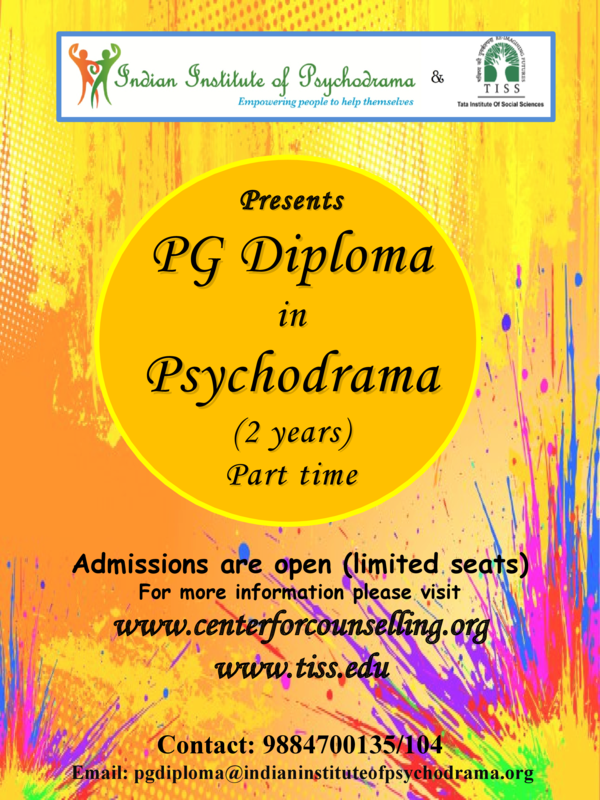 This institute has been awarding students training hours for attending psychodrama workshops since 2009. Also, this institute provides three levels of Psychodrama training on par with other international organisations. Psychodrama is essentially a group action method that helps a person to embrace one’s own capabilities. This could be used in clinical setting (hospitals, therapy centers), non-clinical setting like a business establishment in team building, conflict management, stress management, identifying and working with stress, improving communication, building trust, identifying issues etc. This is a spontaneous and creative method which is used by certified psychodramatists who is otherwise called the Psychodrama director. A director enables or facilitates a re-enactment of real life situations, past incidents / situations or an inner mental process but, acting them out in the present time. The course is taught in English, students applying have to understand, read and speak English fairly well, if not the student needs to let us know how she/ he plans to write assignments etc. 100% Class attendance. In case of an emergency, contact the coordinator to take remedial action. Completions of all assignments, and project work. All these are graded and the grade will appear on the certificate. 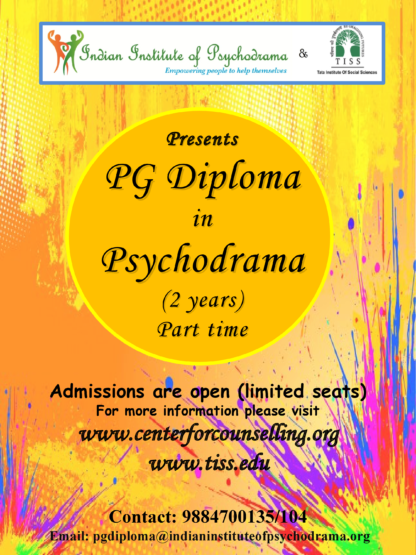 Students will receive a Joint PG Diploma certificate from Indian Institute of Psychodrama and Tata Institute of Social Sciences (TISS). 510 hours 1. Anyone who has completed a Masters in HR/Teaching/Social Work/Psychology/ Psychotherapy can apply. A graduate with 2 years of experience in the humanitarian field. Students complete 315 hours. Students complete 315 hours. Students complete 315 hours. Who are the teachers of this course? Maurizio Gasseau, PhD (Italy): Jungian psychodramatist, psychotherapist and President of the Mediterranean Association of Psychodrama. Director of the Post graduate school of Group Psychotherapy, University of Ivrea, Italy. Dr Jorge Burmiester (Spain/ Switzerland): Psychiatrist, Psychodramatist and Past President of the International Association of Group Psychotherapy and Group Processes (IAGP). Eva Fahlström Borg (Sweden): Senior Psychotherapist and Psychodramatist. She does training and supervision in the field of psychotherapy, psychodrama, sociodrama, Bibliodrama, improvised theatre and restorative justice. She is a founding member of the Federation of European Psychodrama training organisations. Anath Garber, MA, TEP (USA): Psychodramatist who is trained by J.L. Moreno and Zerka Moreno. Was a faculty at Moreno Institute in New York. Member of Executive council of American Society of Group Psychotherapy and Psychodrama. Magdalene Jeyarathnam, MSW (India): Certified Psychodramatist, Expressive Arts therapist and the first Indian living in India to be on the board of Directors of the International Association of group psychotherapy and group Process (IAGP). She is the founder of the Indian Institute of Psychodrama. Teachers are certified Psychodramatists, registered and practicing therapists, professors from colleges/ universities from different parts of the world. A graduate with 2 years of experience in the humanitarian field. All candidates must be 25 years before admission for the Diploma Program. A person trained to be a psychotherapist / counsellor can use Psychodrama in his / her therapy as an addtion to their toolkit. Those training only in psychodrama can continue further to complete 800 hours of training to become a certified psychodrama therapist. Men and women are eligible to be apply, since most alternate therapy courses have a lot of women candidates, male candidates are encouraged to apply. Fill in your application form and attach relevant documentation and post it with a cheque in favour of “Indian Institute of Psychodrama Pvt Ltd” for Rs 500. You will hear from us within a week. If you are admitted into the programme you will have to immediately book your seat by paying the first instalment. We have students from different parts of India and abroad applying for this course. Fees once paid is not refundable as we are securing the seat and cannot take any more students. Please write to us or call us , if you need further clarification.